We Are Voted Best Of Kelowna! You said it Kelowna! 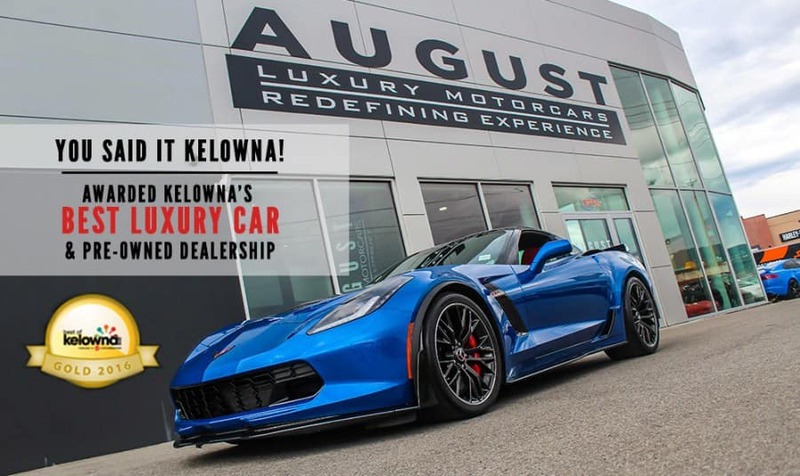 August Luxury Motorcars has been awarded Best Luxury Car & Best Pre-Owned Dealership by Best of Kelowna. Each year, the public is asked to vote for their favourite businesses throughout the community. Thank you Kelowna and Okanagan for awarding us gold and silver awards in 2016! This means a lot to us, especially considering that we have only been open for a year. At August Luxury Motorcars, we strongly believe that the car buying experience does not have to be the maniacal approach that so many of us are used to. That’s why we truly aim to redefine experience, and make the process both as simple, and as exciting as we possible. With our highly educated team of specialists, we strive to continue to offer our city, and our clients the pleasure of dealing with us when it comes to their luxury and exotic car shopping needs. See all Best of Kelowna winners here. 0 comment(s) so far on We Are Voted Best Of Kelowna!